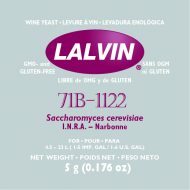 Rehydrate Lalvin 71B in 5 times its weight of water at 40°C. Let stand for at least 20 minutes then gently stir occasionally to break up any clumps. Add to the must.